Four ginger-men and a ginger-woman will be ripping it up! Tamworth Youth Centre's own beat group The Gingermen will be ripping it up at Stafford tomorrow night. As representatives of the Lichfield, Tamworth and Uttoxeter Youth Area they are taking part in the Staffs Service of Youth County Beat Competition. With their singer, Denise Walker, who will be rocking out Chuck Berry's "Monkey Business" and the Lennon-McCartney number "PS I Love You" on the night, drummer Graham Titley, bass guitarist Bob Heath, lead guitarist Dave Bates and Colin Stokes on rhythm will all be turned in to bring the top prize back to Tamworth. But after the competition things will be different. Dave Pierepoint who bears a remarkable all-round resemblance to the "Stone" himself, Mick Jagger, will be taking over the singing spot but since he has only been with the group just over a week he was unable to rehearse sufficiently for the competition. 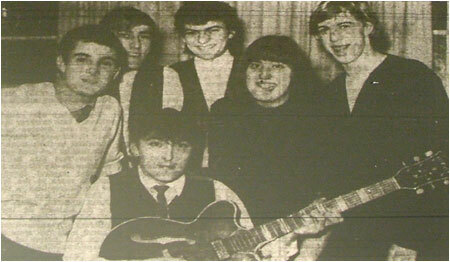 Remember a local beat group called the Gingermen? Yes! Well forget it, there The Inn-Sect now. But a change of name is only one part of the group's change of identity. On stage they have a new look. Their manager persuaded them to dress alike as he felt it creates a good impression. They did it and decided on maroon polo-neck sweaters and white jeans. Their sound has also been given a boost, bass guitarist Bob Heath can plug into a new amplifier and Graham Titley thumps out the beat on a new set of Broggen drums. The group are however steadily changing its repertoire by cutting out some upbeat numbers and bring in a few ballads to cater for the tastes of different audiences. But the Inn-Sect can still hammer out the beat when it's wanted. The present trend of folk music has had its effect on the group and several Bob Dylan numbers have been introduced to their long list. 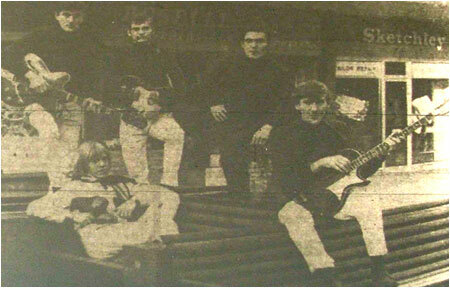 Although they came through an audition to play at the exclusive Belfry Hotel at Wishaw with flying colours they still play to the youngsters at Tamworth Youth Centre where the group was born. Lead singer Dave "Pree" Pierpoint, who rumour has it looks more like Rolling Stone Mick Jagger every day, will be at the microphone on 17th December at Drayton Manor and the group will be featured at the Tamworth Heralds Annual Dinner and Dance. The rest of the group will also be their Dave Bates on lead guitar, Colin Stokes with his rhythm guitar, Bob Heath on bass, Graham Titley on drums. The Gingermen, line-up: Colin Stokes (Rhythm Guitar), Graham Titley (Drums), Dave Bates (Lead Guitar), Denise Walker (Vocalist), Bob Heath (Bass Guitar). The Inn-Sect, line-up: Colin Stokes (Rhythm Guitar), Graham Titley (Drums), Dave Bates (Lead Guitar), Dave "Pree" Pierpoint (Vocalist), Bob Heath (Bass Guitar).